Access Sport is a dynamic charity whose mission is to give more children, particularly in disadvantaged areas, access to a wide range of quality local sport. We achieve this through empowering the inspirational community volunteers who set up and run local sports clubs with cash, expert advice and networking to help create thriving clubs which get more people positively engaged. 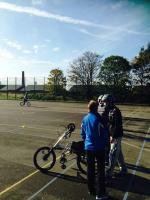 Thanks to a Sport England grant, the club have adaptive bikes which make sessions accessible for people with disabilities.